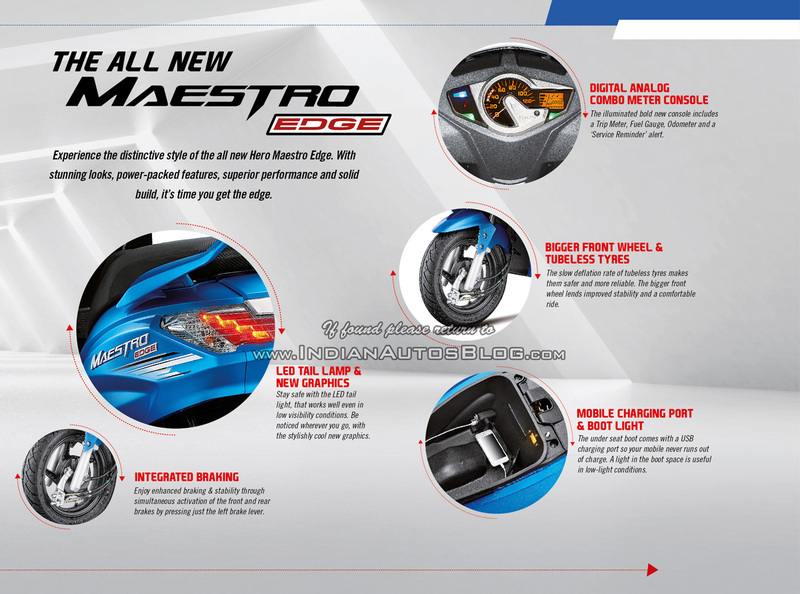 The Hero Maestro Edge, along with the Duet, was the company’s first indigenously developed product. The 2017 Hero Maestro Edge is set to gain new colour options and Auto Headlamp On feature (AHO). The engine too has been re-tuned to meet the upcoming BS IV emission norm. The 2017 edition of the Hero Maestro Edge gains AHO, new colours and a re-tuned engine. At the heart of the 2017 Hero Maestro Edge is an 110.9 cc single cylinder, air cooled, OHC mill coupled to a Variomatic drive. The engine is capable of 8 bhp maximum power at 7,500 rpm (down from 8.31 bhp at 8,000 rpm) and 8.7 Nm peak torque at 5,500 rpm (up from 8.5 Nm at 6,500 rpm). The engine now reaches its peak figures at a lower rpm than before which will have a positive impact on the fuel efficiency front. 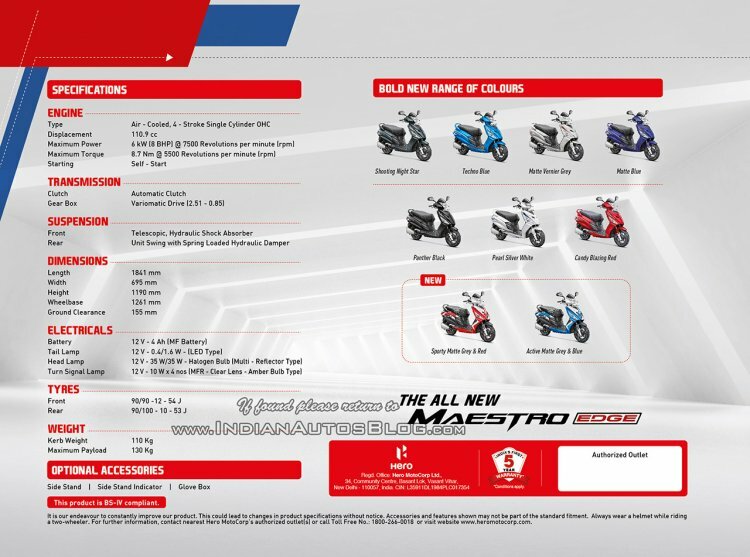 Apart from the previously available seven paint schemes, the Hero Maestro Edge will also get dual tone colours, including Sporty Matte Grey and Red, and Active Matte Grey and Blue. Other features in the 2017 Hero Maestro Edge includes digital & analogue combo instrumentation, integrated braking system, LED taillamp, mobile charging port with boot light and tubeless tyres. The Honda Activa rival also gets a convenient external filling slot near the taillamp and an immobiliser. The engine of the 2017 Hero Maestro Edge reaches its peak output slightly lower in the rev range. The Hero Maestro Edge currently retails at INR 50,330 for the steel wheel version and INR 51,780 for the alloy wheel trim (both ex-showroom, Delhi). The 2017 model can be expected to get a slight price bump.